Rusholme Grange07739 117261work Self-cateringWelcome to our family farm cottage. This delightful cottage has two generous bedrooms, one king size and the other a twin. The bathroom has a bath with an overhead shower. It has a fully fitted kitchen, dining room with a log fire and central heating. Welcome to our family farm cottage. 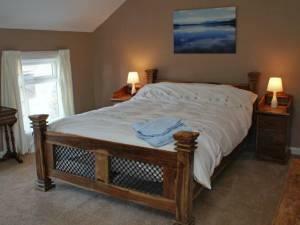 This delightful cottage has two generous bedrooms, one king size and the other a twin. The bathroom has a bath with an overhead shower. It has a fully fitted kitchen, dining room with a log fire and central heating. Enjoy the peace and quiet of the countryside just over a 30 minute drive from York. There are animals on the farm to pet, eggs to collect, and scenic riverside walks. Children welcome from any age. Rusholme Grange offers weekly bookings starting on any day and short breaks of 2 or more days starting on any day. Just six miles from the M62. Head to the village of Drax, passing the pub and the church. Turn right into Church Dike Lane, past the cricket ground and turn right into Rusholme Lane. We are at the end of the lane on the right. Due to our rural location we are not easily accessible by public transport. We travelled as a family of 3, 2 adults and one 11yr old child over Christmas 2018. The hosts Anne and Phil went out of their way to make sure we had a great Christmas, even putting up decorations, a Christmas tree with presents under it and Christmas crackers! This is a spacious cottage with a separate dining room and lounge, very well fitted and equipped kitchen with a walk in pantry. The lounge has an open fire where we lit log and coal fires and enjoyed just relaxing there. The weather was chilly so we did not do much outdoors on the farm but are planning to visit again sometime during warmer weather and use the bbq grill and picnic table outside, as well as explore outdoors here.